The present work emphasizes the efficiency of acid treated Terminaliacatappa seed shell (TTCSS), an agricultural waste for the adsorption of Cu (II) from aqueous solutions. TTCSS is characterized by Fourier Transform Infrared (FTIR), Scanning Electron Microscopy (SEM), Energy Dispersive X-ray Analysis (EDAX) analyses. The presence of carboxylic, amino, phenolic and hydroxyl groups, the surface morphology and elements present in the adsorbent material are evident from the corresponding analysis. Batch equilibration method experiments pertaining to the influence of operating factors viz., particle sizes and doses of the adsorbent material, agitation time between the sorbent and the sorbate species, temperature and pH of the medium for Cu(II)- TTCSS system have been carried out. Conditions have been optimized for the maximum removal of Cu2+ ions (92%) from8 mg/L initial concentration as: 0.18mm particle size, 50 mg adsorbent dose, 60 min contact time and pH 7. The maximum adsorption capacity (Ce) of Cu(II) (7.122 mg/g) is found to be greater than the range between 2.1 – 5.2 mg/g as reported by other researchers for varied sorbent materials. This confirms the enhanced sorption efficiency of Terminaliacatappain preference to various studied materials. Adsorption, Copper ions, Agricultural waste, Characterization, Parameters. Heavy metals, such as Cu, Zn, Pb and Cd, are prior toxic pollutants leached out by industrial waste waters  released from diverse industries such as metal plating, mining, painting, wire drawing, batteries and printed circuit board manufacturing, as well as agricultural sources. The long-term action of heavy metals may cause the development of cancer, allergy, dystrophy, physical, neurological degenerative processes, Alzheimer's and Parkinson's diseases . The Cu (II) effluent from industries spreads into the environment through soil and water streams and accumulates along the food chain, resulting in a high risk to human health. High concentration of Cu (II) intake causes stomach upset and ulcer, mental retardation, liver and brain damage . The permissible limits recommended by WHO for Copper discharge in wastewater and drinking water are 0.05 and 0.005 mg/L, respectively (WHO). Various methods have been used for the removal of metal pollutants from liquid wastes, including filtration, chemical precipitation, coagulation, solvent extraction, electrolysis, ion exchange, membrane process and adsorption. Ion exchange and adsorption are the most common and effective processes for the removal of heavy metal ions . Adsorption is one of the easiest, safest and most cost-effective methods for the removal of these metals from industrial effluent and aqueous solution. It is suitable even when the metal ions are present in concentration as low as 1 mg/L . Ligno cellulosic waste materials are suitable bio sorbents for the removal of heavy metal ions as they are cheap and also further treatments are simple and economic. Most of these materials contain functional groups associated with proteins, polysaccharides, lignin and cellulose as major constituents. The binding mechanisms of heavy metals by biosorption could be explained by the physical and chemical interactions between cell functional groups and adsorbates by ion exchange, complexation and micro precipitation . Terminaliacatappa, a lignocellulosic waste material being cheap, widely available and abundant one is utilized for trapping Cu (II) ions. A systematic study was carried out to assess the potential use of treated T catappa seed shell powder for remediation of Cu (II) from aqueous solutions. Hence, the present study aims at the exploitation and utilization of Terminaliacatappa seed shell Powder (TCSS) for the sorption of Cu (II) ions. Seed shells of Terminaliacatappa were collected from various localities in Coimbatore, Tamilnadu, India. All the chemicals used were of analytical reagent grade. Doubly Distilled (DD) water was used to carry out the experimental studies. Stock solution of 1000ppm copper solutions were prepared by dissolving 2.6826g of CuCl2·2H2O in 1000 ml water. Aliquots of the adsorbate solutions of varying Cu (II) ion concentrations (2-12 ppm: 2ppm interval) were prepared by progressive dilutions of stock copper solution. 0.1 N HCl and NaOH solutions were employed to adjust the pH of the aliquots. Terminaliacatappa seed shells were collected and washed well with distilled water and sun dried. Then the material was pulverized using electrical mixer. The pulverized material was later sieved into different mesh sizes using scientific test molecular sieves. The categorized material (Terminaliacatappa Shell - TCS) was treated with 0.1 N HCl to modify the nature of the sorbent materials, thereafter called as Treated Terminaliacatappa Seed Shell (TTCSS). Physico- chemical characteristics were estimated by determining the moisture content, bulk density, specific gravity, porosity, ash content and pH and the results are summarized in Table 1. The surface characteristics of treated adsorbent before and after metal sorption were studied using SEM and EDAX. FT-IR analysis as a preliminary and qualitative analysis to determine the main functional groups present in the sorbent that might be involved in metal uptake. Imaging microscope analysis was performed using Binocular Microscope (OLYMPUS make, Model- CX21I). Table 1: Physicochemical analysis of TTCSS. Surface areas and pore characteristics of the treated adsorbents were determined using the Brunauer-Emmet-Teller(BET) and Barrett-Joyner-Halenda (BJH)plots respectively, which employs nitrogen adsorption on an Accelerated Surface Area and Porosimetry System, (Micromeritics, BEL, Japan, Inc),sophisticated with Belsorp adsorption/desorption data analysis software. Prior to analysis, portions of adsorbents were degassed for 5 hours at 120°C in N2 environment using a Micro meritics degassing system. The characteristics values, specific surface areas (Table 1) were determined via N2 adsorption/desorption isotherms obtained at 77 K. Analyses were repeated, at least twice, for both the adsorbents. Experiments were conducted to estimate the influence of varied particle sizes and dosages of the TTCSS, prescribed agitation time intervals between the sorbent- sorbate interface, solution pH in order to establish the optimum experimental conditions for adsorption process. The agitated samples were filtered and the residual concentrations of the Cu (II) ions were analyzed using AAS (AA- 6200, Shimadzu make). The percentage removal. where Co and Ce are the initial and equilibrium concentrations (mg/L) of Cu(II) ions in solution. V is volume (L) of solution and m is weight of adsorbent (g) taken. The percentage adsorption of metal from aqueous solutions was estimated using the following equation . Scanning Electron Microscopy was used for characterizing the surface morphology of the adsorbent material. SEM picture of TTCSS is illustrated in Figure 1a and Cu (II) loaded TTCSS is in Figure 1b. They have holes and cave type openings on the surface of the adsorbent which could definitely increase the surface area available for adsorption. 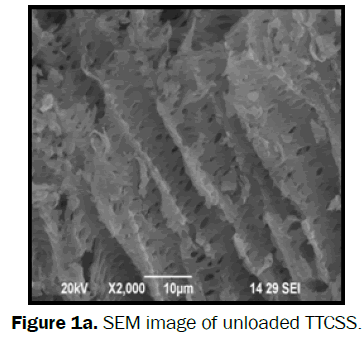 Figure 1a: SEM image of unloaded TTCSS. Figure 1b: SEM image of loaded TTCSS. The EDAX spectra were recorded to analyze the elemental constitution qualitatively for the modified adsorbent. The spectra of TTCSS before and after adsorption are depicted in Figures 2a and 2b and it shows the presence of O, C, Ca and Cl in the adsorbent. These have been known as the principle elements of the adsorbent. These are summarized in Table 2. The presence of peak for Cu (II) in Figure 2b shows the metal adsorption onto TTCSS. Figure 2a: EDAX results of unloaded TTCSS. 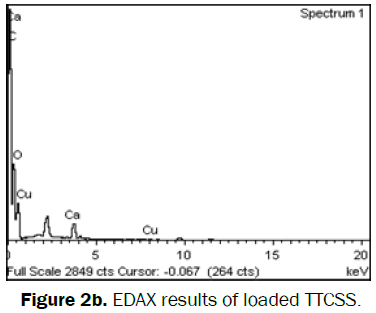 Figure 2b: EDAX results of loaded TTCSS. Table 2: Data for the elements presented in TTCSS and TTCSS-Cu. The FTIR spectra of unloaded/ loaded sorbent materials and functional groups/frequency ranges are shown in Figure 3 and Table 3. 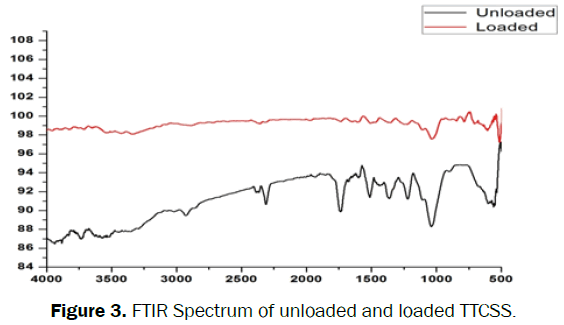 Figure 3: FTIR Spectrum of unloaded and loaded TTCSS. Table 3: IR frequencies and characteristics groups. In both the spectra, a wide band was observed between 3600cm-1 3200 cm-1 for the stretching of O-H groups present in the structure of both cellulose and lignin. It was also observed that there were two peaks at 2919 cm-1and 2852 cm-1 related to the C-H groups of the aliphatic chain. The region between 1800- 1200 cm-1, refer to characteristic peaks of cellulose and lignin. The peaks at 1737 cm-1 are characteristics of C=O of aldehyde present in the lign in . The region between 1300 and 700 cm-1 showed the characteristic peaks of aliphatic ethers at 1154 cm-1and 1105 cm-1 and aromatic ethers at 1031 cm-1. A decline in the peak intensity in the region of the characteristic groups was perceived as the difference between unloaded and loaded material. This decrease may be due to the adsorption of copper ions. Adsorbent particle size has a significant influence on the kinetics of sorption due to change in number of adsorption sites. The sorption experiments of Cu (II) carried out for three different particle sizes of MTHP viz., 0.18, 0.30, 0.42 mm are shown in Figure 4. The steep rise in the curve indicate that the smaller 0.18 mm particle size of TTCSS exhibited maximum percentage removal (92%) for Cu(II) ions. The number of binding sites for adsorption increases with surface area. This is due to higher surface area of unit weight for lesser particle size and thence greater percentage removal . In view of these experimental results, it was decided to limit the discussion of further experiments using 0.18mm particle size for Cu(II)-TTCSS system. The TTCSS microscopic structure of 0.18mm particle size is depicted in Figure 5. 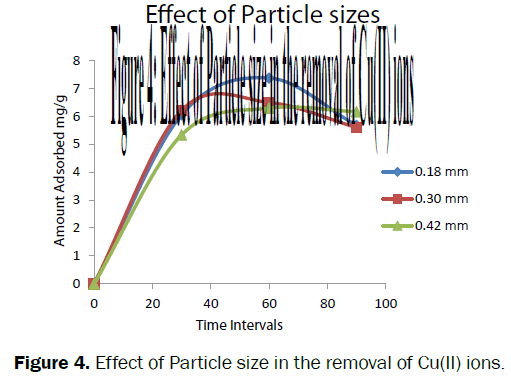 Figure 4: Effect of Particle size in the removal of Cu(II) ions. Figure 5: Microscopic Structures of TTCSS. The amount of adsorption of Cu (II) increased with the contact time. The gradation in the amount adsorbed is represented by the continuous smooth rise in the curve (Figure 6) plotted against the preset time intervals (30-90 minutes:30 minutes interval). From the figure it is obvious that the amount adsorbed (mg/g) was maximum at an agitation period of 60 minutes (7.221 mg/g). A linear decline in the curve after 60 minutes which is depicted by the semi parabolic nature of the curve indicates that the system approaches towards desorption of the sorbed Cu (II) ions. Therefore, it is concluded that 60 minutes is the optimum contact time for the maximum removal of the metal ions under study wherein equilibrium has been attained. As the surface sorption sites become exhausted, the rate of removal is controlled by the rate of transport from the exterior to the interior sites of adsorbent particles which may be responsible for the slower stage . 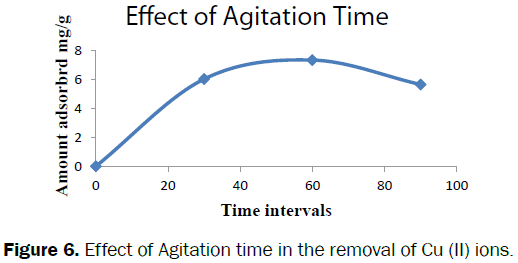 Figure 6: Effect of Agitation time in the removal of Cu (II) ions. Adsorbent dose seems to have a great influence on sorption process. Variations in dose of adsorbent ion determine the number of binding sites available for adsorption. The adsorption density decreased from 7.122 to 6.54 mg/g for the removal of Cu (II) ions when the adsorbent dose was increased from 50mg to 200mg at 50mg intervals as evident from Figure 7. It is obvious from the figure that 50mg of TTCSS had maximum adsorption of Cu (II), the corresponding curve being atop in the graph. The decrease in adsorbent density is basically due to the adsorption sites remaining unsaturated during the adsorption process. This may be due to the overlapping and aggregation of adsorption sites which occurs as a result of overcrowding of adsorbent particles due to increase in the dose . 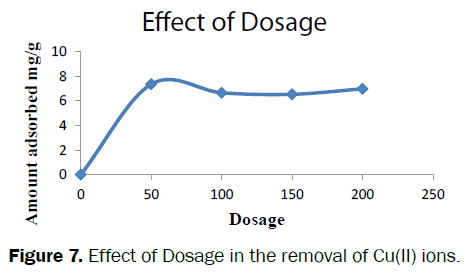 Figure 7: Effect of Dosage in the removal of Cu(II) ions. The pH dependence for maximum removal of Cu (II) ions onto TTCSS was studied at varying pH environments viz., 3-11. It was observed that the ability of trapping Cu (II) ions by TTCSS is pH dependent (Figure 8) wherein the maxima had occurred at pH 7. Binding sites are generally protonated or positively charged (by the hydronium ions) at low pH values. This leads to repulsion between the metal cation and the adsorbent at a higher pH value (beyond pH 7) . The precipitation of insoluble copper hydroxide might have occurred at pH values greater than 7 which are represented by the inverted parabolic curve. 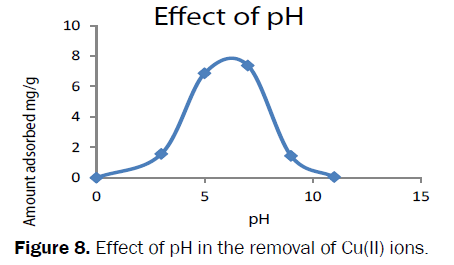 Figure 8: Effect of pH in the removal of Cu(II) ions. Temperature has an important effect on the process of adsorption. The percentage removal of Cu (II) as a function of temperature (293K to 333K) is presented in Figure 9. The smooth steep maximum increase in the curve at 303K and further decrease at high temperatures suggests that maximum percentage removal (92%) had occurred at room temperature. Kinetic energies of Cu (II) ions were low at low temperature (20°C) which reflects in the percentage removal of Cu (II). This may be due to the difficulty in the process for ions to reach the active sites on the adsorbent. The decrease in percentage values with rise in temperatures may be due to the desorption caused by an increase in the available thermal energy. 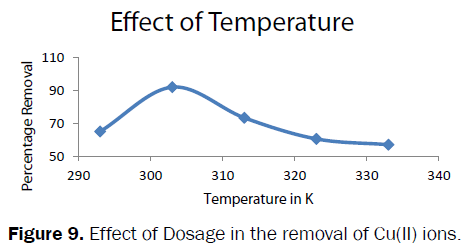 Higher temperature induces higher mobility of the adsorbate molecules causing desorption . Figure 9: Effect of Dosage in the removal of Cu(II) ions. 1. The changes in the FTIR spectra confirmed the complexation of Cu (II) ions with the functional groups present in the sorbent material. Also, the surface morphological change, elemental constitutions and surface area of TTCSS shown by SEM, EDAX and BET respectively, emphasize the results obtained sorption capacity for material. 2. At neutral pH conditions and at room temperature the trapping of 8mg/L concentration of Cu(II) ions by TTCSS registered maximum at an optimal dosage of 50 mg, specific particle size of 0.18 mm, agitation time interval of 60 minutes. 3. In view of this enhanced adsorption capacity of TTCSS compared to many other low cost adsorbents reported in the literature, Treated Terminaliacatappa is a promising adsorbent for the removal of heavy metal ions. The authors would like to thank Defence Research & Development Organisation (DRDO) for their financial support to this work. Peric J, et al,Removal of zinc, copper and lead by natural zeolite—a comparison of adsorption isotherms. Water Research 2004;38:1893–1899. Kvesitadze G, et al, Biochemical Mechanisms of Detoxification in Higher Plants Springer.Verlag Berlin Heidelberg 2006. Goyal M, et al, Removal of copper from aqueous solutions by adsorption on activated carbonsColloids Surf. A Physicichem.Eng. Aspects 2001; 190:229-238. Achanai B, et al,Removal of Cu2+ from Aqueous Solution by Biosorption on Rice Straw - an Agricultural Waste Biomass.Inter. J. of Envir. Sci. & Develop 2012; 3: 10-14. Uttam S, and Rajesh KK, Treatment Of Waste Water With Low Cost Adsorbent –A Review.VSRD International Journal of Technical & Non-Technical Research 2013;4: 33-42. Xue SW, et al,Removal of chromium (VI) from aqueous solution using walnut hull. J. Environ. Manage 2009; 90:721-729. Raimundo NP, et al, Study on the use of Roasted Barley Powder for Adsorption of Cu2+ Ions in Batch Experiments and in Fixed-bed Columns.Bio. Res 2013; 8: 3556-3573. AhmetO, et al, Adsorption of lead onto formaldehyde or sulphuric acid treated acorn waste: Equilibrium and kinetic studies.Bio chem Eng. J 2007;37: 192-200. MuhammadR, et al,Pb(II) biosorption from hazardous aqueous streams using Gossypium hirsutum (Cotton) waste.biomass,J Hazard Mat 2009; 161 :88-94. Anandkumar J and Mandal B, Removal of Cr(VI) from aqueous solution using Bael fruit (Aegle marmelos correa) shell as an adsorbent. J. Hazard Mater 2009; 168: 633-640. Shanthi T and Selvarajan VM.Removal of Cu (II) Ions from Aqueous Solution by Carbon Prepared from Henna Leaves Pungam Bark and CAC. J. of Che. &Pharm. Res 2012; 4: 4296-4306. Khazaei I, et al, Use of Agricultural Waste for Removal of Cr (VI) from Aqueous Solution. Iran. J. of Chem. Eng 2011; 8: 11-23. Ira N. Levine, Physical Chemistry, 5th edition, Tata McGraw Hill Publishing Company Ltd, New Delhi, India.1995.